This review first appeared in the May 2015 issue of high-end hifi magazine fairaudio.de of Germany. You can also read this review of Accustic Arts in its original German version. We publish its English translation in a mutual syndication arrangement with the publishers. As is customary for our own reviews, the writer's signature at review's end shows an e-mail address should you have questions or wish to send feedback. All images contained in this review are the property of fairaudio or Accustic Arts - Ed. Others use this amount of metal for a pair of monos without risking a jittery foundation or ringy covers. Our DAC tester stems from the Reference range of Accustic Arts who work with a different set o' rules. Remember the Amp II/AMP III transformer häuser? Or the MONO II we reviewed last year? Mentally prepped, I took in stride the 12kg pulling out my arms whilst I unpeeled the Schwabians’ top digital deck from its carton. Tube Dac II Mk2 is its proper title. In for a pound, out with a kilo. But forget brutish material excess. This deck exudes luxury no matter what angle you ogle it from. The surface finish of the brushed aluminium is perfection. So is the fit of all seams. Bomb-proof socketry adorns the business end. Brass knobs turned from solid and dipped in chrome transfer tactile feedback on the front. Sure, sour pusses and minimalist sticklers will point out that the stylized valve symbol cut out of the top panel à la Tube Preamp II serves no real function. But hey, hasn’t one already chased those bitchy Calvinists away by mere consideration of this type sticker in the first place? Of course it’s glamour, not Bauhaus sobriety. This is a luxury machine, dammit. Anyone shopping this price range demands special optics and fit’n’finish sans pareil. Hence any such expectations are met head on by this posh player. 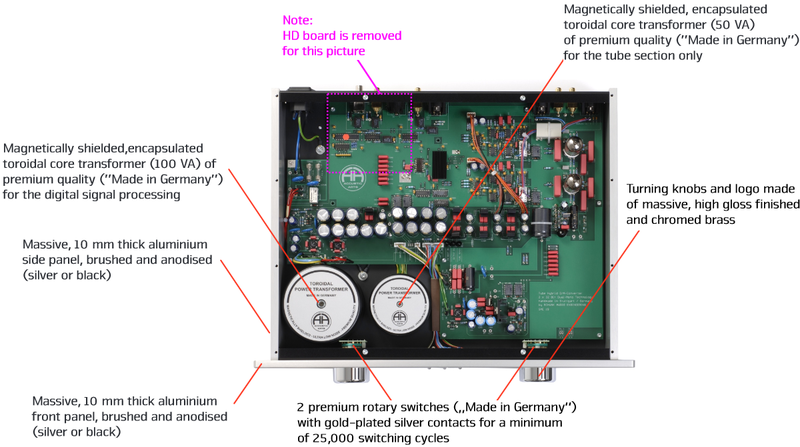 I’ve not met anything quite as deluxe in the DAC sector yet. True, this house’s top converter is nearly a classic by now. Its predecessor launched in 2007. The core circuit remains in place. To sketch it on a napkin, focus on three points. 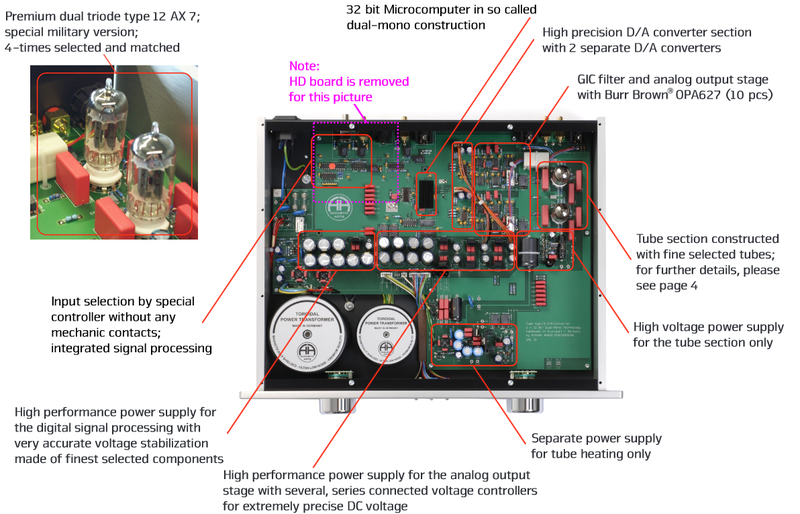 One, the over- dimensioned power supply would suit many an amplifier. Two power toroids of 100 and 50VA respectively gang up with 84’000µF of filter capacitance. Deux, digital goes deux mono with two parallel paths, two chips and a 32-bit microprocessor entrusted with signal prep and upsampling (which, say the Germans, operates significantly more accurate than the typical on-chip SRC). Finally, nomen est omen, a hybrid valve/transistor output stage with balanced and single-ended legs. Fixed gain only. That's because, or so feels developer Martin Schunk, shoppers in these strata tend to be married to a separate pre/power combo already. Where the Mk2 does the original one better is the HD input card with its asynchronous USB. HD obviously is short for hi-def, i.e. 24/192 (though not 32/384 or DSD). "We might offer a future upgrade. It’ll depend on demand." Martin Schunk shrugs. I’m personally amused by the present DSD hype. Never mind the excessive dearth of relevant music catalogues [amen and hallelujah to that – Ed]. For equally good reasons, I’m only marginally interested in how makers and distributors describe the sonics of their own kit. "Rendering all else broken by comparison" is all so… well, boorishly boring. Still, I readily remember the words which did accompany the Tube Dac II Mk2. Something like, "designed for the audiophile gourmand" but "minus any FX". Yeah, here I’ll sign my own Kaiser Wilhelm on the dotted line! That’s because any true gourmand couldn’t give a fork about identifying specific ingredients. She wants their masterful combination to melt on the tongue in unison. A proper chef better remember that. And that’s exactly how our DAC chef has cooked his deck. Does it deliver unheard of resolution? BMC’s UltraDAC plays no second fiddle. Extreme depth layering? Perhaps. But my Luxman D-05 does it too. Punchy bass? Definitely. Though I do recall a CD player which dished it out even harder, Gryphon’s Scorpio. So no, don’t expect gold medals to step out of individual disciplines. That’d mean special effects all over again. And that's really the last thing anyone would ever accuse our German of. It’s the particular mix which is so tasty (and to finally wear out the foodie parallel). This machine plays it so integral, so effortless and 'right' that individual aspects are synthesized into and absorbed by a wholosity which eludes lead-pencil analysis. You simply listen to music. But fear not, I’m not about to drop my ball point just yet!